Are we near the Cliff Edge? No. And though we could be up the risk curve the markets are by no means over stretched. We cannot hurry markets as they will do everything at their own pace – including edging close to the cliff and toppling over. When they choose rationally or other wise. The reasons being is that I would like to point out the dramatic market spurt – the blue line - in the last few weeks. A common phenomenon after range trading – marked in yellow. Sometimes described as like a compressed spring suddenly released – the pressure creates massive energy. Some pundits might say the sudden burst of energy is the last hurrah. Maybe. Maybe not. 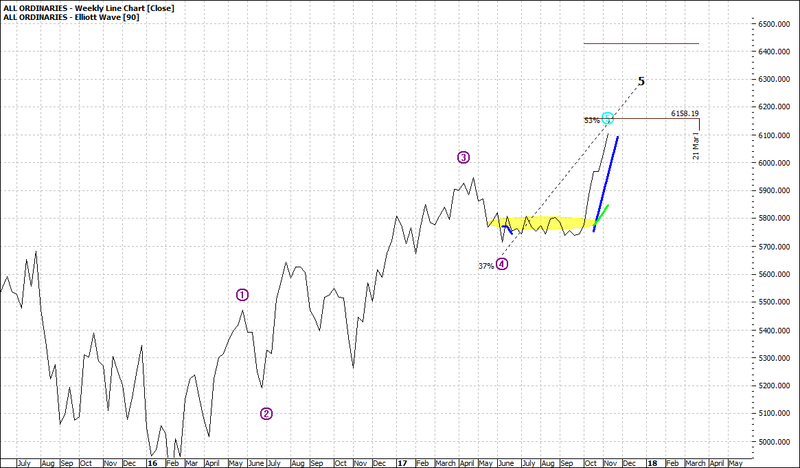 The two horizontal lines in the top right-hand corner are levels that Elliott analyse suggest the markets might reach. The first line is highly likely, and the second line suggest a higher level – barring no mishaps. From my own experience I would assign a probability of the second wave – second line – to be of the order of 60%. The right-hand end of the line suggests a time in which the target might be met. If you envisage a vertical line to the x-axis this would mean a likely high about March 2018. That is, a possible high of around 6800 in about August 2018. I don’t hold a strong view about either – though I do have a view that the market has still much to go as I spoke about in an article only a few weeks ago. One thing I always remember from my own coal face experience is that markets overshoot to the upside – and to the downside. Some may argue that 6800 is too high and unsupported by the fundamentals. Maybe – that is my point, markets are not always rational. We will have plenty of time to talk about this before markets get over excited. 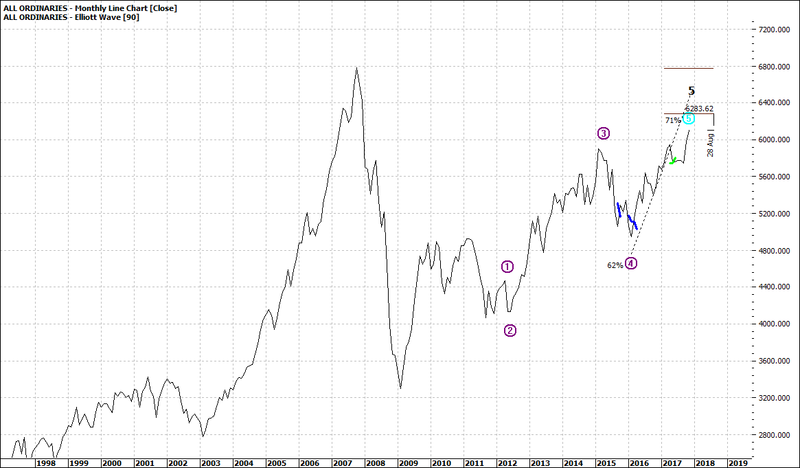 One final point I would like to raise is that 6800 is about the high of 2007. This time the market needs to push right through 6800. If it fails to do so it will be a major sign of weakness – a so called ‘’double top’’. That could be the cliff edge.